If you are a regular viewer of the UFC or have friends who train in grappling, chances are you have noticed something called cauliflower ear, or traumatic auricular hematoma as the doctors call it. Cauliflower ear is a condition that occurs when the external portion of the ear suffers a blow, blood clot or other collection of fluid under the perichondrium. This separates the cartilage from the overlying perichondrium that supplies its nutrients, causing it to die and resulting in the formation of fibrous tissue in the overlying skin. As a result, the outer ear becomes permanently swollen and deformed, resembling a cauliflower. That sounds rather unpleasant. Without quick treatment involving the draining of the swollen ear, it will calcify and remain deformed for life, however, most fighters are not so quick to seek treatment for several reasons. The most quoted reason is that it has become something of a badge of honour for the super tough, a sign that the bearer of such ears is a trained fighter or grappler who has put in their time in the training room. Another reason not to seek treatment is because of the high likelihood of the injury reoccurring during another training session. Fighters don’t like to wear head gear, so they simply accept the cauliflower ear look and get on with it. 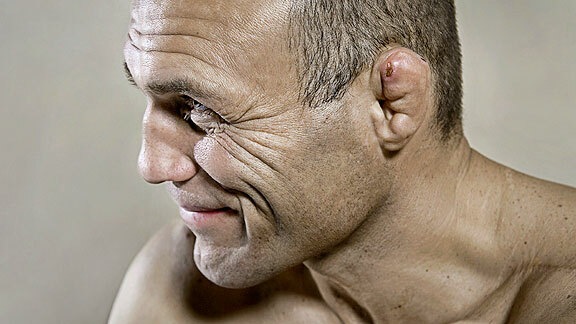 Not all cauliflower ear is created equal of course, so let’s take a look at some of the worst occurrences in the brief history of mixed martial arts! It’s hard to talk about cauliflower ear without mentioning Sweden’s favourite fighting son, Alexander Gustafsson. ‘The Mauler’ is currently the number 2 ranked light-heavyweight contender in the UFC and is known for being the man who almost beat the unbeatable, Jon Jones. Back in 2013 Gustafsson faced Jones in what many thought would not be a competitive bout, however, he managed to go all five rounds with the champion, pushed the pace, landed often and even secured some take-downs. In the end, he lost a close decision but cemented his place as one of the greatest light-heavyweight fighters in the world. The opening to his ears remains clear however his upper lobes have been morphed into random collections of skin protruding from the sides of his face. They serve to add to his tall and imposing frame, giving him a very intimidating look. Gustafsson is a natural fighter, a true champion born to pursue the martial arts. If you ever had any doubt as to a fighter’s mindset when it comes to their ears, just listen to The Mauler’s response when asked if he would have them repaired after he retires. He answered, ‘I’m proud of them, it means I’ve gone through some tough battles.’ That is the mindset of true warrior. Frankie Edgar is as tough as they come, the former UFC lightweight champion and current top-ranked featherweight contender takes on all comers with expertly executed takedowns, dominant top control and relentless cardio. He’s also one of the most technical boxers in the UFC, and he possesses some very impressive and noteworthy ears. Cauliflower ears can often shrivel up into small circles, or they can be long and stick out from the head, Edgar’s are definitely the latter. 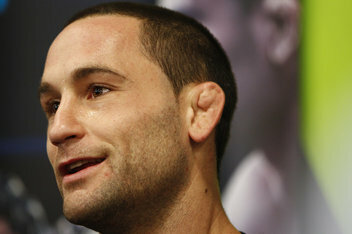 You can be sure of three things in life, death, taxes and the fact that Frankie ‘The Answer’ Edgar cares very little about what his ears look like. In a way, they actually work as the perfect accompaniment to his tough New Jersey personality. They are a part of the Edgar that fans know and respect, that badge of honour we mentioned earlier. However, they are far from the worst we have ever seen. The next man on our list is someone whom Frankie is very familiar with. 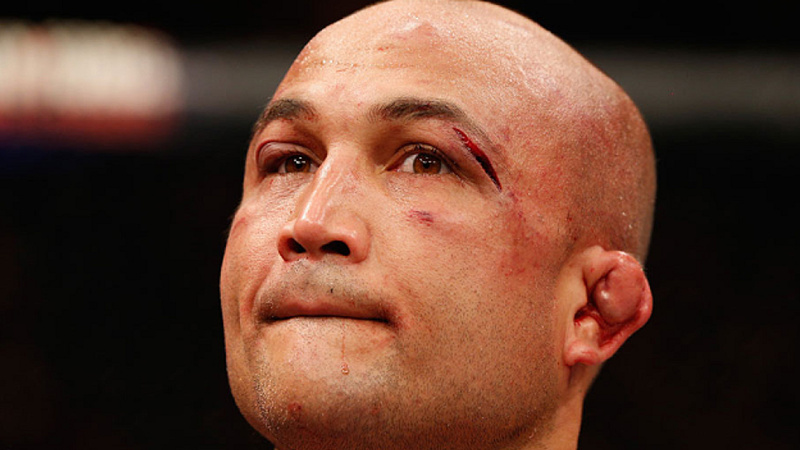 BJ Penn may have lost three fights to Frankie Edgar, but in his prime, the man known as ‘The Prodigy’ belongs on every list of MMA legends out there, and on our list of the worst cauliflower ears. The Prodigy is the perfect name for the man from Hilo, Hawaii. BJ earned his Brazilian jiu-jitsu black belt in just three years and was the first non-Brazilian to win the black-belt division of the world jiu-jitsu championship. He competed in mixed martial arts in the Featherweight, Lightweight, Welterweight, Middleweight, and Heavyweight divisions. That’s right, he fought Lyoto Machida at heavyweight back in 2005 in k1. He is the former UFC lightweight and welterweight champion and one of the all-time greats of our sport. BJ’s ears are actually quite different from each other, with his left ear usually being singled out as the prime example of horrendous cauliflower ear. 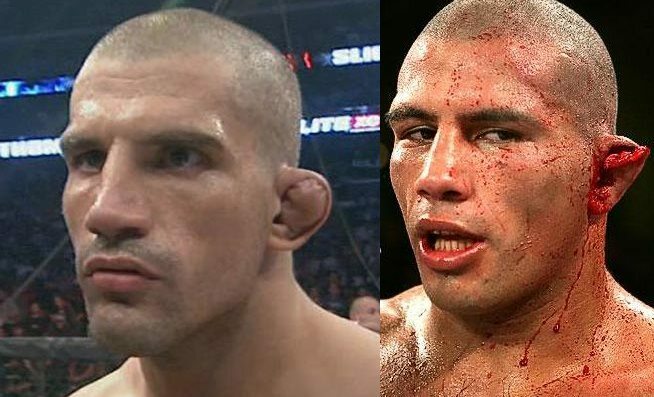 Another thing to understand is that cauliflower ears will often vary from year to year and fight to fight, training, sparring and fights inside the octagon can damage the ear further, altering it’s appearance. Over a long career, several different pictures will crop up showing their ears at the best or worst, in Penn’s case the worst is probably a well-known shot that essentially shows his left ear looking like two smaller pieces of ear that hardly meet in the middle. When he’s an old man living on the beach in Hawaii, when his grandchildren ask him about his strange ears, he can tell them all about the time he became a two-division UFC Champion. English heavyweight James Thompson competed in MMA organizations such as pride and Bellator among others. He is, however, best known for a headline bout in EliteXC in which he took on Kimbo Slice back in 2008. He entered the cage with a noticeably swollen cauliflower ear to begin with but managed to get to round three without much trouble, winning both rounds one and two with superior grappling. However things went downhill from there, eventually Kimbo landed a big punch to the left ear of Thompson, and it quite literally exploded. Blood was everywhere, what remained of the ear was really just some dangling skin stuck to the side of his face. The referee stepped in to stop the fight and outraged Thompson in the process. After all, it was just an ear. UFC bantamweight contender Leslie Smith proves that cauliflower ears aren’t just for the men of MMA. Although not as bad James Thompson’s overly swollen growth, she entered her fight against Jessica Eye in 2014 with recognisable cauliflower ear. Early in the fight Eye threw a punch that scraped along the left ear of Smith, causing it to erupt it glorious HD. The fight had to be stopped a few minutes later when it appeared as though her ear was on the verge of falling off. Smith for her part was against the stoppage, proving once again that MMA athletes will endure just about anything to get the win. No list of cauliflower ears would be complete without the inclusion of this man. Randy ‘The Natural’ Couture was the first ever two division champion in the UFC capturing belts at both light-heavyweight and heavyweight. The latter of which he won well into his 40’s. He is a veteran of a record 15 UFC title fights and one of the stars of The Expendables movies. He is also number 2 on our list. The Natural grew up wrestling, developing a gritty toughness that would serve him well in his UFC career, and a nasty set of ears. His brand of cauliflower ears can be described as ceasing to resemble ears in any way. They are now just shapeless lumps of skin stuck to the side of his head, it’s impressive that he is still capable of hearing. With the addition of Randy to our list, it now contains the only two-division champions in UFC history, The UFC hall of fame is fast becoming a Mount Rushmore for cauliflower ear. Whether it’s in the octagon, or on a Hollywood set, you can bet that Randy wears his cauliflower lumps with pride. Coming in at number one is another true legend of our sport, Japanese native, Kazushi Sakuraba. He is known as the ‘Gracie Hunter’ or the ‘Gracie Killer’ due to his wins over four members of the famed Gracie family, Royler Gracie, Renzo Gracie, Ryan Gracie, and Royce Gracie. In particular, Sakuraba is famous for his initial fight with Royce, which lasted ninety minutes. He is also the former UFC Japan Heavyweight Tournament Champion and holds wins over Vitor Belfort and Rampage Jackson. As with Couture, Sakuraba started his life in combat sports on the wrestling mat at a young age, and possesses a toughness rarely matched. Like the rest of the fighters on our list, Sakuraba’s ears tell the story of his long career, but he had never had anything happen to them like what happened against Marius Zaromskis at Dynamite 2010. Early in the fight, a punch caused Sakuraba’s ear to burst open, with blood spewing in all directions. The referee called the fight to a halt and the doctor inspected the ear, eventually letting the bout continue.